If we really want to be picky, the economy isn't in a recession. Economic decline began in December 2000, continued through much of 2001, and ended in September 2001. U.S. economic growth since then has actually been stronger than Germany, France, Japan, and the United Kingdom. The high priests who many look to to determine whether a recession has taken place and how long it lasted are the members of the Business Cycle Dating Committee of the National Bureau of Economic Research. The committee decided that the recession began in March 2001. They have yet to determine when the recession ended or if the current economic sputtering is part of a same downturn. Last week the Labor Department announced that the unemployment rate remained at 6 per cent, but the nation lost 181,000 jobs for the year. During this economic downturn, 2 million jobs have been lost. Anecdotal evidence also shows economic sluggishness. During this Christmas season I saw more applications from a wider range of people in years. Either people were looking for retail jobs to make up for a layoff or to supplement lost hours in a primary job. Also, all of us know more people than usual dealing with layoffs or a reduction in hours. A plus for the economy announced this week is increasing productivity. If that continues to improve, wages should follow. Better wages give consumers more spending power, which will encourage businesses to take risks to capture that new spending. Take job losses together with a tepid holiday season and even if officially we are not enduring a recession, we certainly are going through tough economic times. The question becomes what to do about it. Last week, President Bush provided his answer to the country. It entails ending the double taxation on dividends, advancing the tax cuts passed in last year's tax bill, increasing the child tax credit, and increasing the amount small businesses can deduct for equipment. It isn't surprising that economists don't agree on whether President Bush's economic plan is good or bad. Cynthia Latta of Global Insight told USA Today, "In the short term, it will produce a little more activity. Long term, it will produce larger deficits and therefore probably higher interest rates and probably some tax increases later on." Mark Zandi of Economy.com said, "It's a much-needed boost to a struggling economy." The administration's number one economic opponent, Paul Krugman sees little in Bush's plan to stimulate the economy. "And instead of helping the needy, the Bush plan is almost ludicrously tilted toward the very, very well off," he writes. In Krugman's mind, the economic plan is Karl Rove's (the "man in charge") way of fattening the wallets of the rich at the expense of everyone else. Slashing the dividend tax would encourage more companies to offer dividends to their stockholders. That would take money out of company bank accounts and short-term investments and let investors reallocate that capital in more effective ways. Companies who issue dividends would also be less inclined to try and cook their books to boost their stock's price. Dividends have to be paid out periodically so pumping up earnings through accounting tricks wouldn't matter so long as the dividend wasn't affected. Increasing the child tax credit from $600 to $1000 lets families keep more of their money. Keeping more money in the hands of self-interested individuals instead of an incentive-less government is always a good thing. Boosting the amount small businesses can deduct for equipment purchases from $25,000 to $75,000 a year will encourage small business to buy more. That should help manufacturers of capital goods (especially technology). The problem with this portion of Bush's plan is it's way too small an amount. A business could easily reach that limit by buying a few medium-size trucks, and it doesn't help medium and large businesses. What is most encouraging about Bush's plan is pushing up the tax cuts that were to be phased over years. The top tax rate would be 35 per cent; down from 38.6 per cent. This provides an immediate signal to entrepreneurs that risk-taking and moneymaking will be better rewarded. 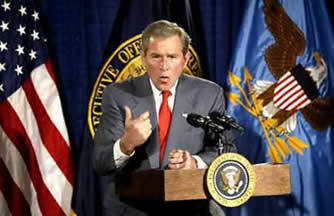 Giving the economy a swift kick in the pants is what President Bush did with his economic proposal. By letting people keep more of their own money, Bush is betting on the power of self-interest and individual initiative. Sean Hackbarth comments on political economy and culture at The American Mind.